Copenhagen Downtown Hostel was rated the Most Popular Hostel in Copenhagen in 2015, and it's easy to see why. They're centrally located, just between Christiansborg Palace and the Tivoli gardens, within walking distance of Kastellet, the Little Mermaid and Freetown Christiania. Many Hostelworld guests have said 'it's probably the best value for price you will without leaving the central area'. We like that this clean hostel loans out hair dryers, laptops and iPads. The onsite bar and cafe has games and a daily happy hour. No complaints at all! Everything perfect in the hostel, toilets and showers super clean, great atmosphere. Close to train station, making it easy to get there from the airport, central location and close to most of the touristic spots! Would definitely stay again! Fantastic place to say. Great things to say about everything except the bathrooms and showers which were still fine, just not great. They were clean but still smelled unfortunately. Also it was fairly noisy most of the time, not just on weekends. On the plus side, staff were always helpful, courteous, kind, and amazing. Ambience fantastic, the bar, though noisy, was fun, engaging, and easy to meet/mingle with others. Great location, easy to walk or public transport anywhere. Highly recommend! Great hostel with perfect location. The only bad thing is that you have to pay to rent the towel and also to leave the luggage in the locker room. I really enjoyed my stay! The hostel is in a perfect location with all the main attractions only a short walk away. Rooms were very big and the beds were extremely comfortable (probably the comfiest hostel bed I’ve slept on). Staff at the reception were lovely. Walking tour was great! Only downside is the hostel is also a bar and on fridays and Saturday’s they play loud music until really late, like 5am. They do give out free earplugs at reception though. Definitely recommend this hostel. I think what puts us ahead of the rest is that we're the real backpackers' in town, made by travellers for travellers. 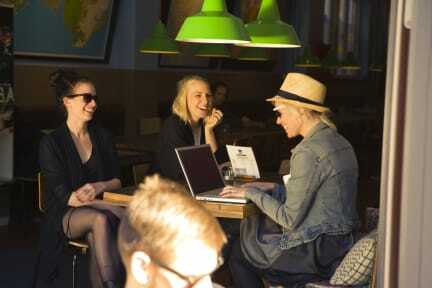 We want you to experience the real Denmark, its people, its humor and its personality. I believe that this place is the expression of a hostel how should be all around the world - full of magic, activities, livable common areas and crazy people that give this place an enjoyable and fun atmosphere. The common area features a Scandinavian retro design with recycled wooden floors from old Copenhagen apartments used for the tables and benches, plus a lot of bright colors, wall maps, and other design features to make the area warm and welcoming. There's lots to do in this area but I definitely recommend visitng Christiania - the Freetown - a unique place occupied/squatted in 1971 and now a community, where people live and chill out. Furthermore, the place has grown with bars, cafés, restaurants, concert places, art and has its own very peculiar atmosphere.